uncube's editors are Sophie Lovell (Art Director, Editor-in-Chief), Florian Heilmeyer, Rob Wilson, Elvia Wilk and Fiona Shipwright; editorial assistance: Sara Faezypour; graphic design: Lena Giovanazzi, graphic assistance Diana Portela. In the run up to the Expo 2015 in Milan, uncube takes stock of what’s so weird, wonderful and plain warped about World’s Fairs. What began as a glorified industrial age trade fair has transitioned through national branding, motivational propaganda, one-upmanship and hymns to the future into a series of giant, multi-billion dollar temporary world spectacles that nobody quite remembers the reason for. In this issue, we invite an illustrious set of expert authors to take us on a journey through some of the most interesting World’s Fair iterations – and the questions they throw up. We have an exclusive interview with Jacques Herzog who talks about masterplanning a World’s Fair in 2015. And we ask: will Milan set new sustainable standards or be just another giant global party with the environmental impact of a crude oil spill? Nationalism, brand identity, propaganda, politics and economics, all wrapped up in spectacle and shiny architectural gestures: Expos, says author and historian Paul Greenhalgh, are a quintessentially modern invention – the most effective peaceable way to wage war. When the Shanghai Expo closed its doors for the last time on October 31 2010 it was the most heavily attended Expo of all time. 73 million visitors strolled and queued around the spectacular site on the banks of the Huangpu River in the heat and the rain, to see structures and buildings built by the Chinese and by 246 participating countries and international organisations. In all dimensions it outstripped everything that had gone before and appeared to signal the complete revival of the Expo medium. So as we watch the final preparations for the Milan Expo 2015, the next fully official universal exposition after Shanghai, the question presents itself as to what, in the twenty-first century, these enormous undertakings are actually for? What are they actually about? First of all, and without being too cynical, we can say that over the last 150 years the success or failure of Expos has never really been to do with culture, education, social improvement, the arts, urban planning, or international understanding, to cite some of the themes they have purportedly been about. These were invariably the grand rhetorical messages trumpeting out from the sites, and obviously significant displays onsite dealt with these themes: in the golden age of Expo however, the driving forces were not these but something else: politics and economics. Expos are a quintessentially modern invention, the physical manifestation of material progress, and their rationale can be found in the need for money and national cohesion. That is why governments and the private sector have invested in them, and why they were often created on gargantuan scales. They were the most effective peaceable way to wage war. World’s Fairs haven’t enjoyed an even history since the founding event, The Great Exhibition of the Works and Industries of All Nations held in London in 1851. There were two periods in which the medium took on a frequency and a drama that effectively made them into golden ages: the fin de siècle, and the 1960s. During the first, beginning with the Philadelphia Exposition of 1876, there was an epic-scale Expo somewhere in the world every few years through to the First World War. In some years, such as 1888 (Glasgow, Barcelona, Melbourne), or 1906 (Toronto, Marseilles, Bucharest, Christchurch) there was more than one. Every one of these was spectacularly ambitious and, judged by their own criteria, highly successful. Each one would have made the Millennium Dome, the last feeble and ill-fated attempt at the medium in England in 2000, look like a village fête. Major cities, such as Paris, Chicago, Philadelphia, Barcelona, Brussels, San Francisco, Buffalo, Turin and St Louis were transformed by them, and as this list shows, at that point Expo was basically a creature of Europe and North America. The second golden age, boasting far fewer but truly spectacular events, was the 1960s. The sequence then was Brussels (1958), Seattle (1962), New York (1964), Montreal (1967), and Osaka (1970). The five shared a stylistic, artistic, technological, and intellectual consistency that helped shape and define that brilliant short run of years. One of the more remarkable statistics is that at 51 million visitors, more than double the population of Canada attended the Montreal Expo. These two golden ages, contained Expos that in so many ways shaped, influenced and reflected the culture and ethos of the societies they decorated. Paul Greenhalgh is a writer, historian, university and museum professional in the fine and decorative arts. He is currently Director of the Sainsbury Centre for the Visual Arts, one of the UK’s principal research institutions for the study and display of all forms of visual art. Prior to this, he held a number of senior posts around the world, including Head of Research at the V&A Museum in London, President and Director of the Corcoran Gallery of Art and College of Art and Design in Washington DC, President of NSCAD University in Canada, teacher at the Royal College of Art and Cardiff College of Art and Design. He has organised various large-scale exhibitions in a number of countries, including the UK, USA, France, Spain, Japan, and Canada, most notably Art Nouveau 1890-1914 (2000-2001, London, Washington, Tokyo). He has lectured all over the world and has published a number books and articles across his specialist areas, which include fin de siècle art and design, Modernism and Modernity, Art Nouveau, Symbolism, Cubism and Abstract art; the History of Ceramics; and the contemporary crafts. His books include The Modern Ideal: The Rise and Collapse of Idealism in the Visual Arts from the Enlightenment to Postmodernism, The Persistence of Craft: The Applied Arts Now, and Art Nouveau 1890-1914 and Fair World: A History of World’s Fairs and Expositions. The Paris Expositions Universelles of 1889 and 1900 branded the city forever, and brought every great artist, designer, musician, novelist, scientist, and businessman in Europe into the French capital; the Chicago Columbian of 1893 created the city and St. Louis was a different place after 1904. And later, the sixties Expos provided a vision of optimistic flamboyance that provided a template for urban life across the planet. The Seattle Fair marked the arrival of the West Coast as the capital of hi-tech; Montreal defined modern Canada; and the Osaka Expo, the first in East Asia, signalled the arrival of the new Japan as a world power. After 1970, as glib irony increasingly defined urban existence, and the postmodern world defined itself through texts that no one had read, the Expo slid into decline. Pessimism doesn’t make Expos: the model is Star Trek, not Blade Runner. There were still large-scale events, but collectively they were less visions of the future, and more educationally inflected, consumer-driven funfairs. First among equals in the history of Expo structures, the Crystal Palace was built in London’s Hyde Park to house the Great Exhibition in 1851 and display the very latest technology. The glass and steel building was a gigantic technological feat in itself, housing more than 14,000 exhibitors in 9,200 square metres of exhibition space. It was perhaps the greatest feat of architectural Empire-branding ever undertaken in the UK. The design was by Joseph Paxton, who was, appropriately enough, a gardener by trade. Three years later, the building was moved to a new home on a hill in Sydenham in south-east London and extended in size. Here it shared a park alongside a set of newly-installed dinosaur models and landscaped water features. Photo: Public domain/originally published in The Sphere, 1936. “Imagine for a moment a giddy, ridiculous tower dominating Paris like a gigantic black smokestack”. To the modern eye, it’s almost inconceivable to imagine the city without that most famous of tours. But this icon of the French capital, indeed of the country itself, was not met with universal acclaim upon the unveiling of its design in the late nineteenth century. During its construction a group of 300 writers, painters, sculptors and architects launched a campaign to “protect” the beauty of Paris from Gustave Eiffel’s 324 metre-tall feat of iron lattice engineering. The “Artists’ Protest” which raised the “smokestack” objection would ultimately fail and the rest is of course history, albeit one that has seen the tower facilitate the discovery of cosmic rays, survive two world wars and earn its designer a considerable fortune from the entrance fees before it became state property. 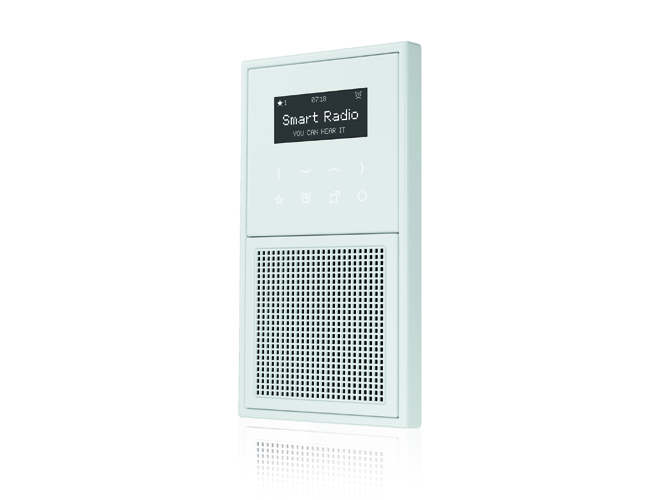 As an alarm clock, musical background in the bathroom or as breakfast entertainment, the new Jung Smart Radio is a faithful companion throughout the day. 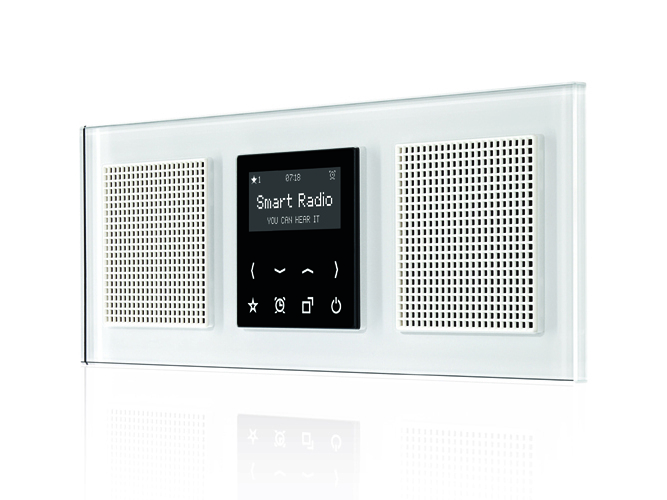 The appeal of the Jung Smart Radio in switch design is in its black or white touch display and its unique glass front. 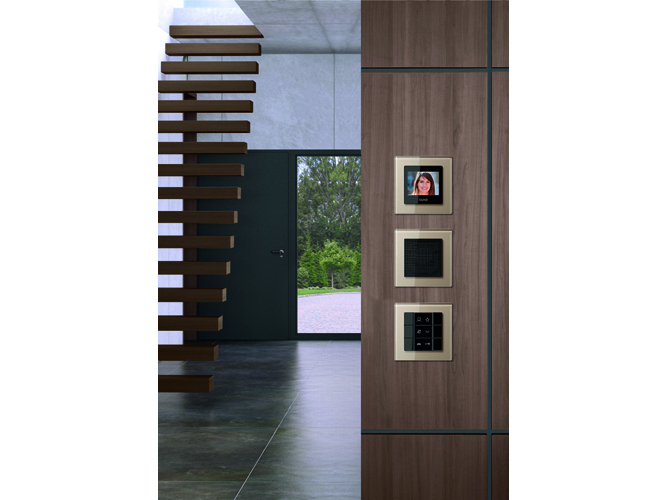 Its shortcuts enable rapid access to the alarm and sleep timer function and the list of favourites. The brightness of the display and the buttons can be separately adjusted as required to radio operation or night-time mode. 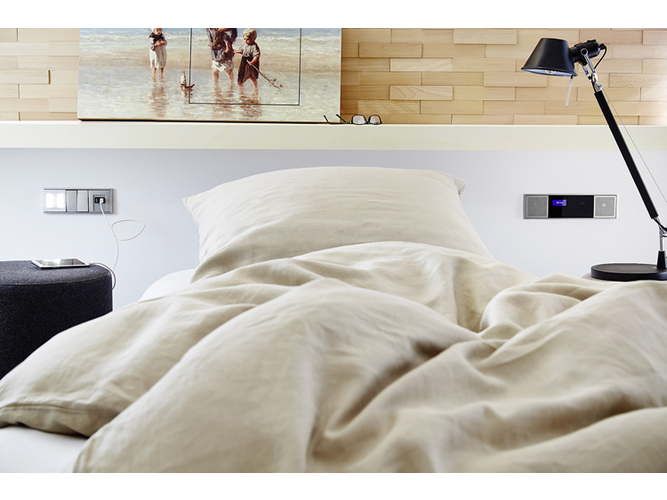 The button and display illumination is then completely faded out, so the new Smart Radio does not disturb your sleep. 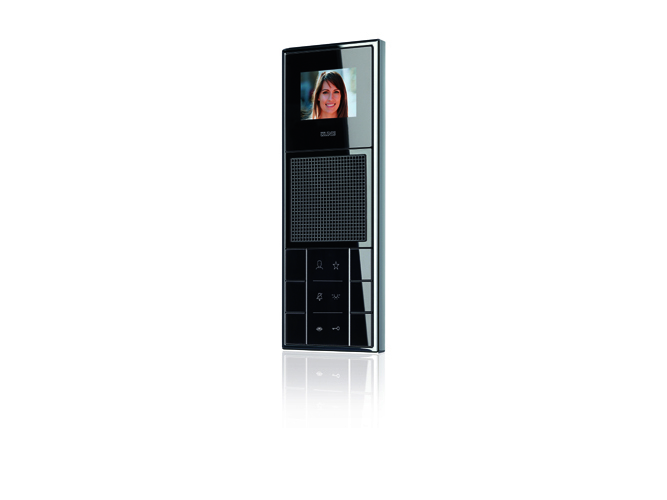 Its features are rounded off with satellite and auxiliary inputs. 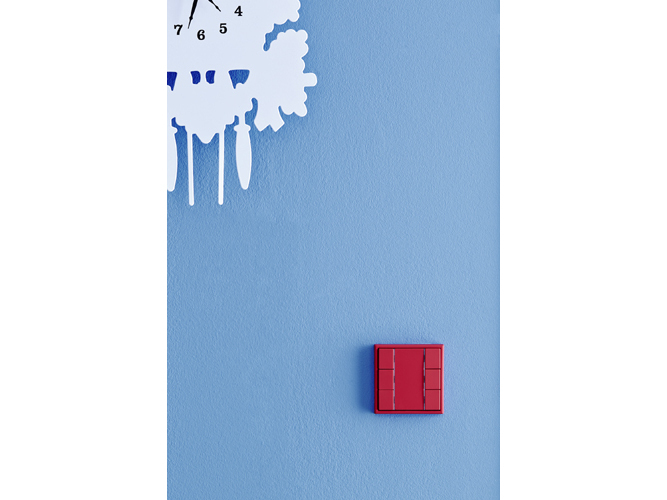 Convenient automatic synchronisation of the time is enabled with RDS reception. The Jung loudspeakers with their integrated bass reflex tubes guarantee the best stereo or mono sound quality. The external antenna ensures optimal reception even in difficult conditions. 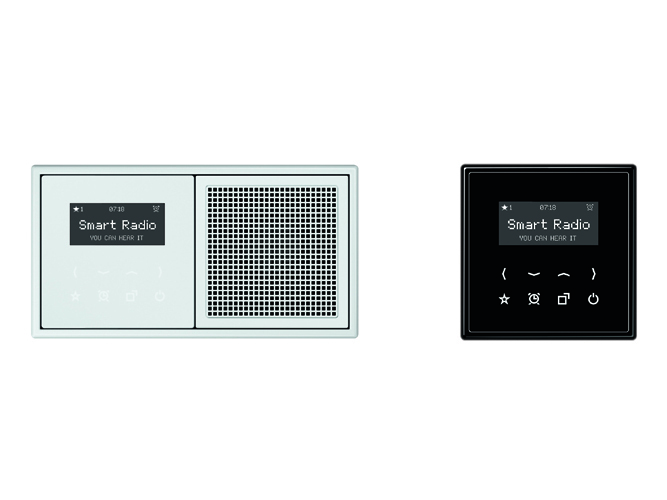 The Smart Radio is shown to its best advantage in a choice of black or white displays in the coloured A creation glass frames. Of course all the other frames in the A range also combine perfectly with this. 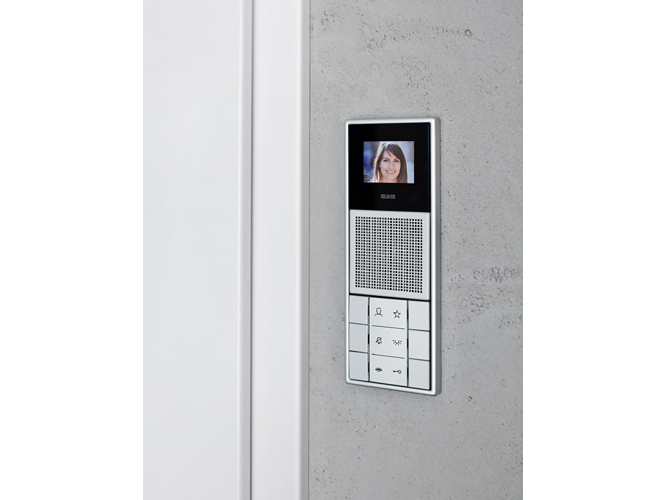 With the JUNG modular system, the Smart Radio loudspeakers can also be installed separately. 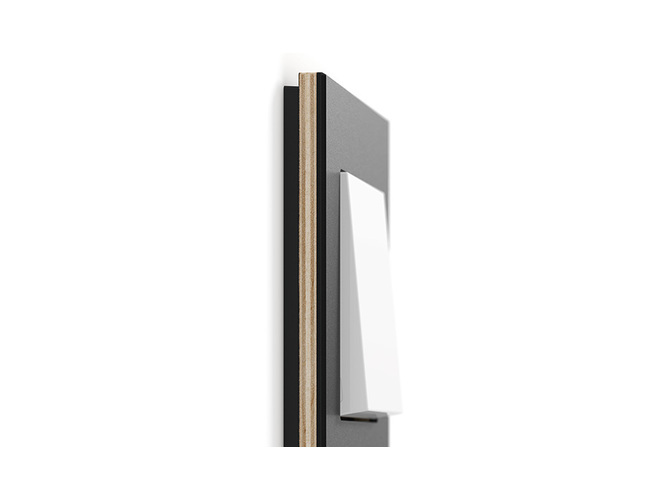 The soft lines of the CD frames ensure that they give a harmonious impression. 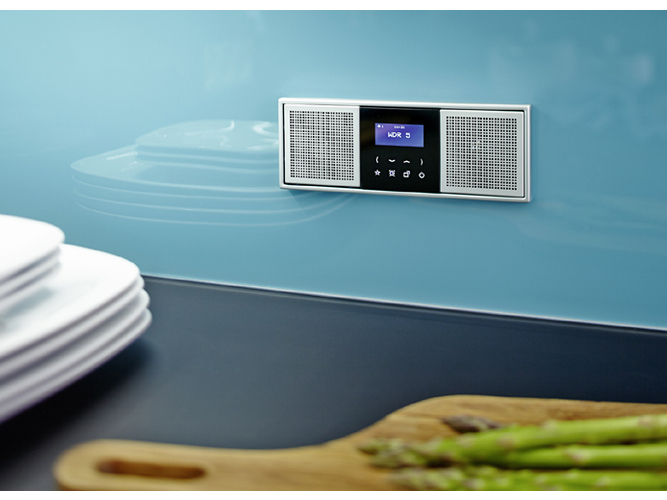 The design of the classic LS 990 range gives the Smart Radio and loudspeakers a uniquely elegant look and can be mounted in single or multiple frames. 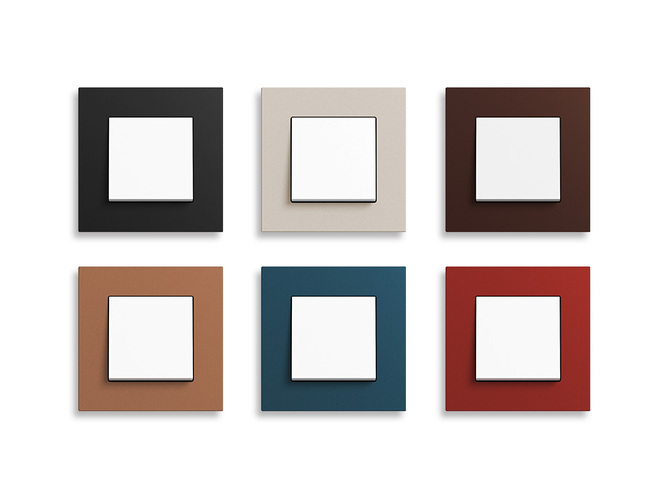 Of course the other frame variations in the LS range will also look distinctive. JUNG, the specialist in building system technology, and Siedle, the specialist in building communication are putting their forces together. 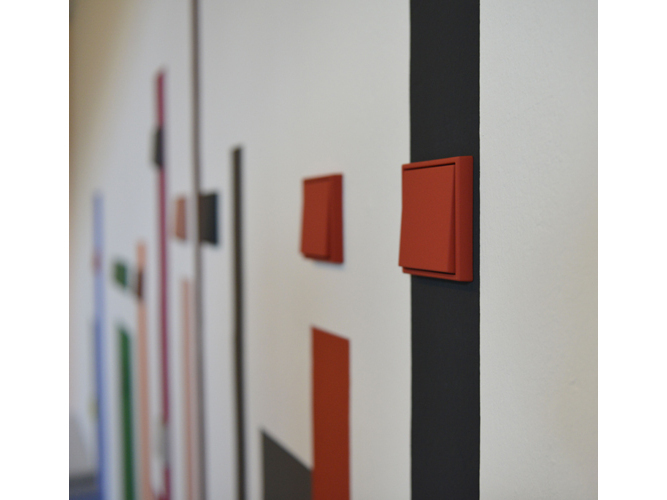 Variable installation of the indoor stations is possible with the JUNG modular system. 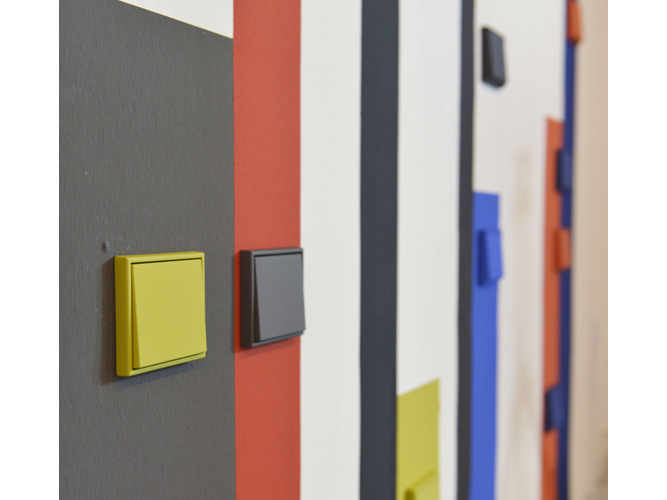 Because the indoor stations are integrated in the JUNG switch ranges, there is uniformity in design along with a varied selection of colours and frames. 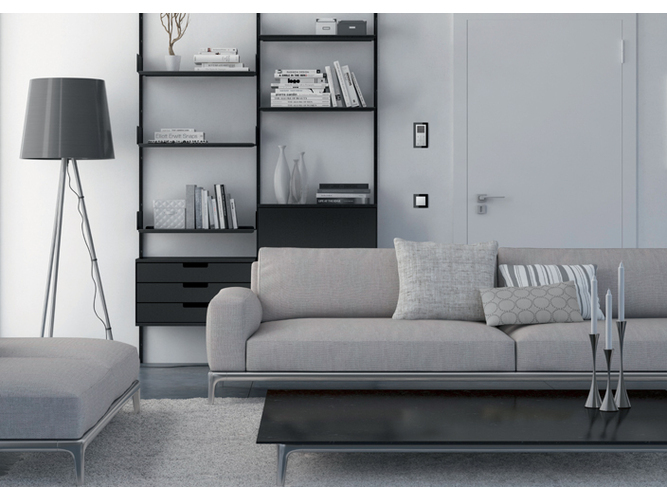 Be it modern in the AS and A ranges, harmonious in the CD range or timeless in the LS range - the JUNG indoor stations integrate perfectly into the overall impression of your home. 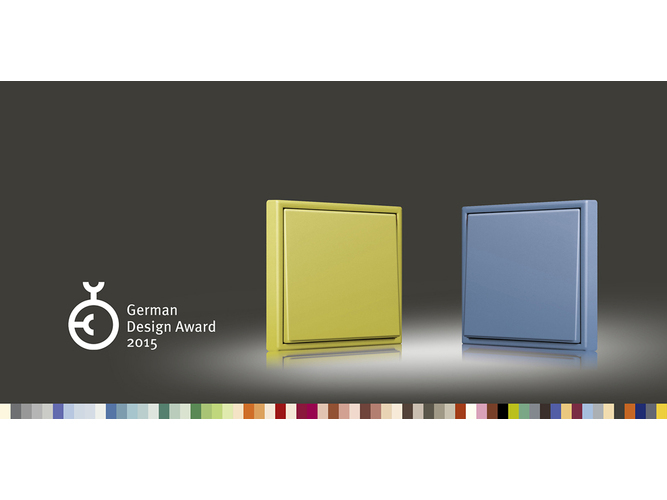 By the way: The JUNG audio and video indoor stations are nominated for the German Design Award 2016! 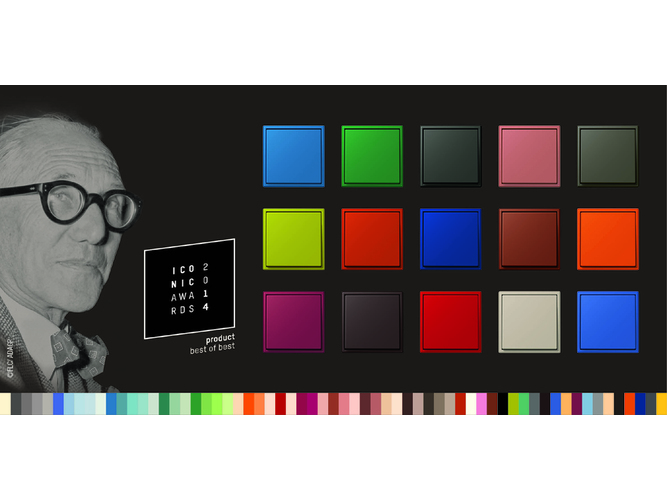 The German Design Council distributes this premium award for high-class templates from the product and communication design. 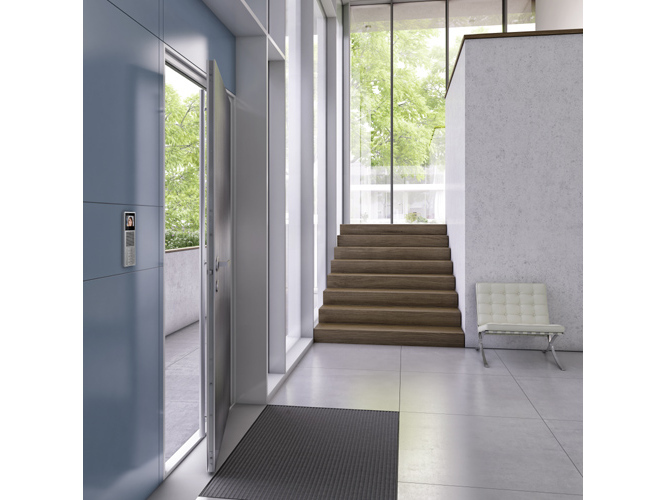 Concrete, the classic material of discerning architecture, is now increasingly being used indoors. Concrete surfaces have a characteristic expression that are always entirely unique. 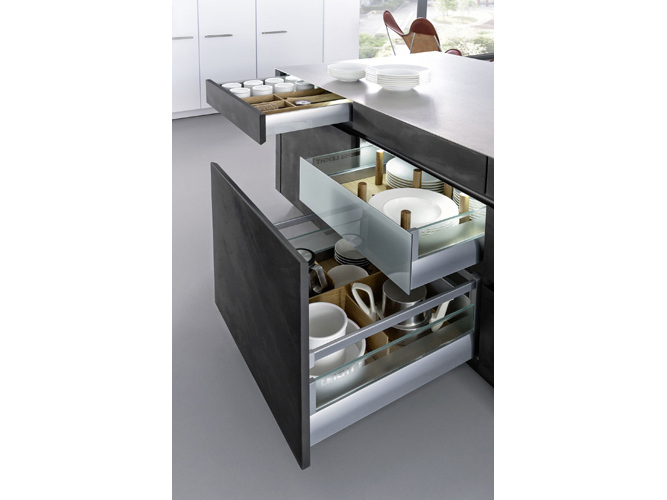 Qualities that make this timeless material so precious for the design of individual kitchens. 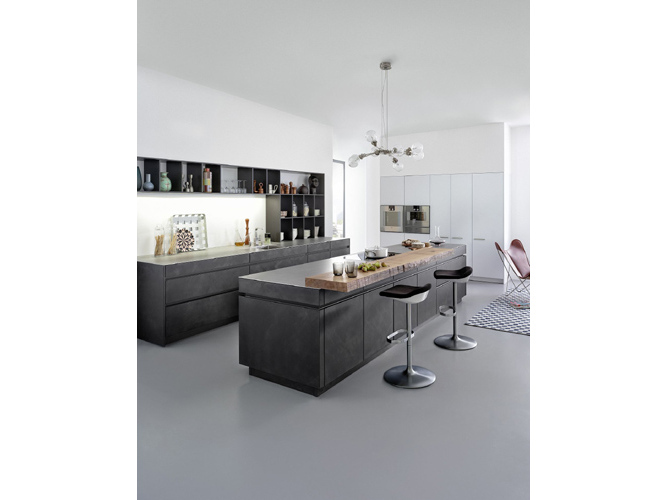 Concrete is known as the “marble of the modern era”. 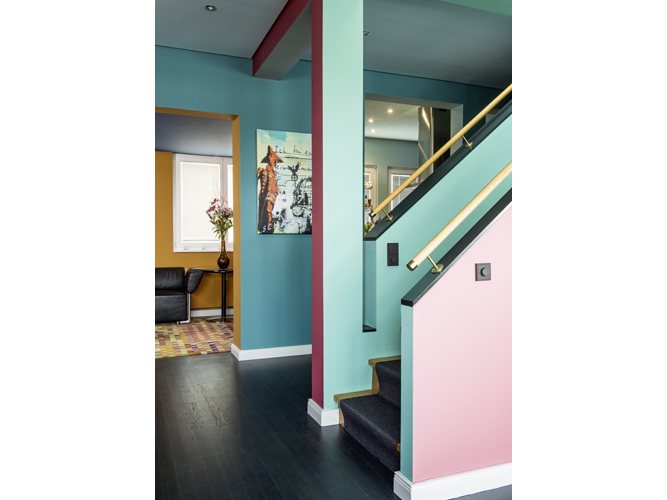 Today this modern building material is increasingly found within the interiors of sophisticated, minimal designed, family houses. 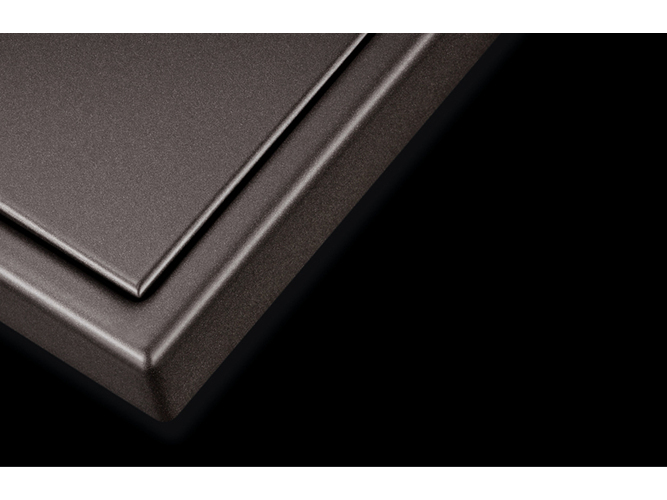 Now, for the first time, LEICHT is using this extremely versatile material, held in high esteem by architects world-wide, for kitchen fronts. 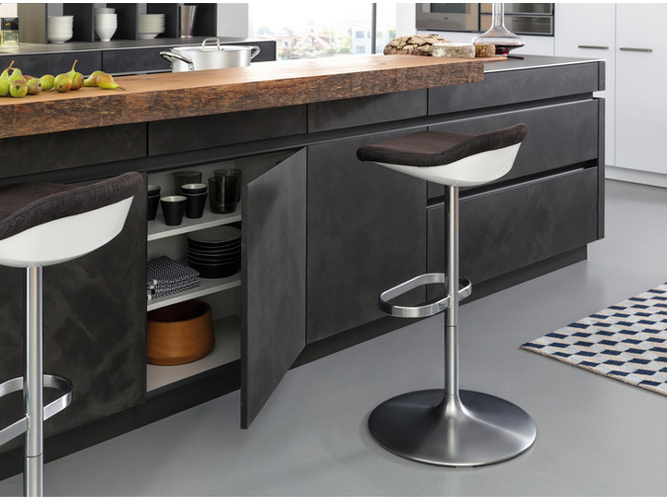 This opens new perspectives for a kitchen design, oriented towards architecture inspired by the Bauhaus movement, based on an internationally valid design language. 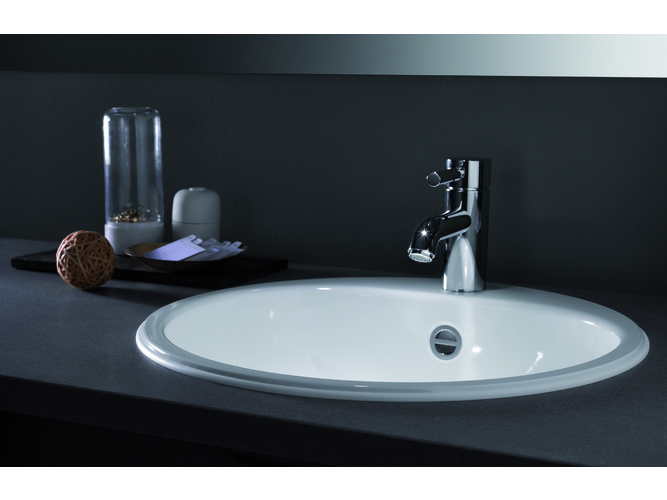 Concrete stands for modernity, for timeless aesthetics and a strong expressive power, exactly the qualities that characterise LEICHT. Together, material and brand image provide a convincing and tangible unit for the end customer oriented, towards architecture and design. The manufacture of a CONCRETE front demands much know-how and craftsman’s skill. 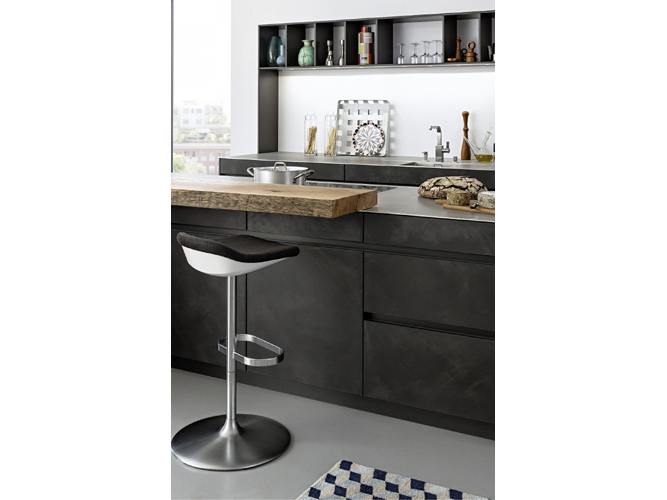 Fine concrete is manually applied with a spatula to a lacquered MDF -panel. 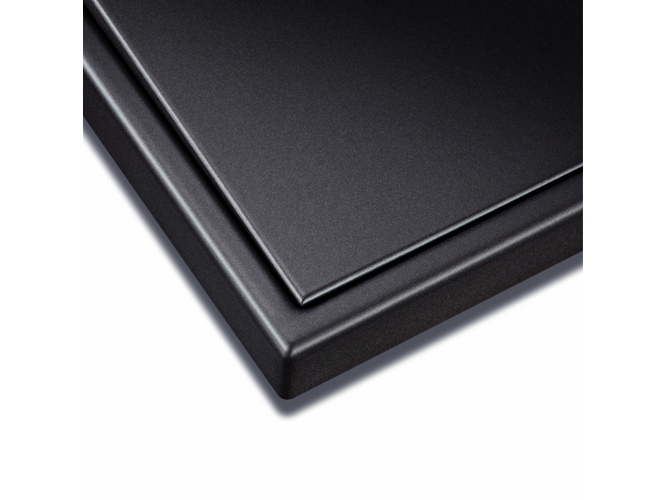 This produces an authentic, unique surface appearance with subtly changing spatula textures. Differently refracted light further brings the front to life. 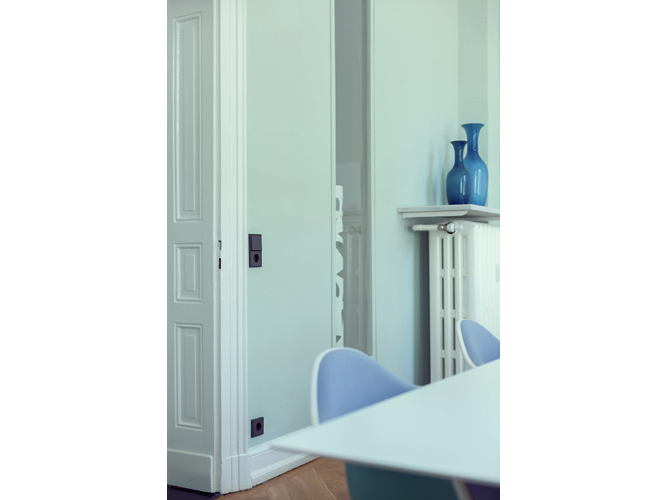 A matt lacquer seal makes the front very durable and gives it a silky feel. 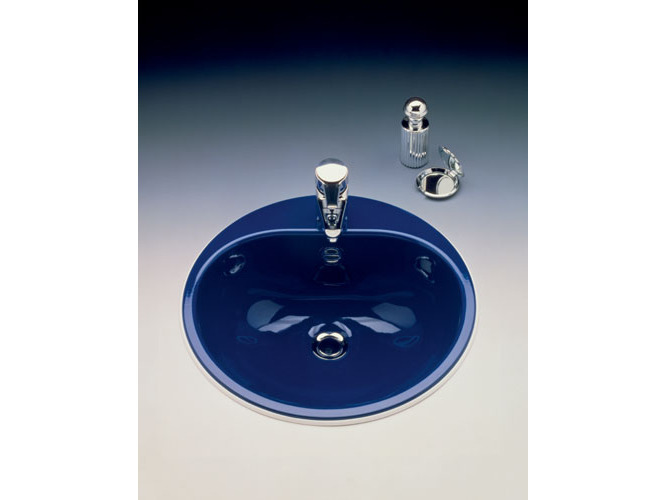 Three iridescent colours contribute to the wide design range in the LEICHT Collection 2015. There is a choice of a light (manhattan), a darker (brasilia) and a rusty tinted grey (le havre). 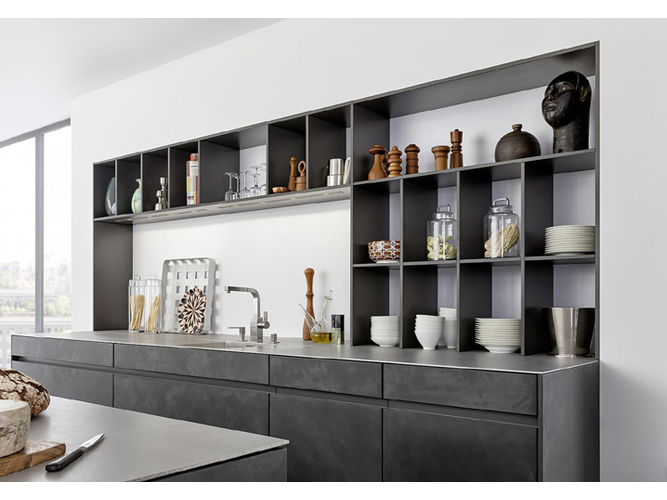 Every kitchen front, every design element is hand made to the desired dimensions. 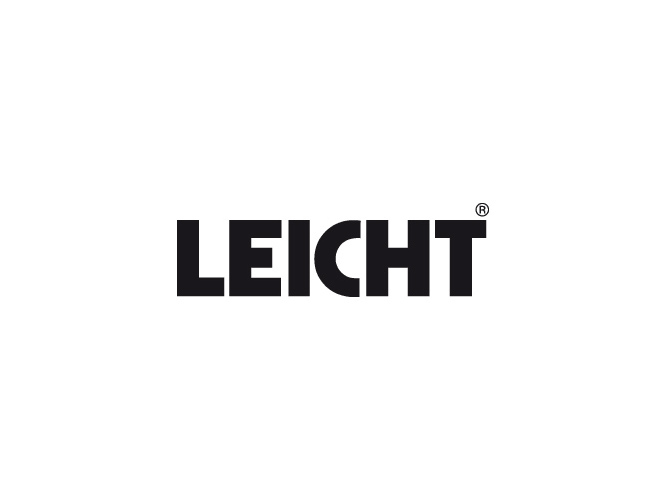 Find all information on the LEICHT website. 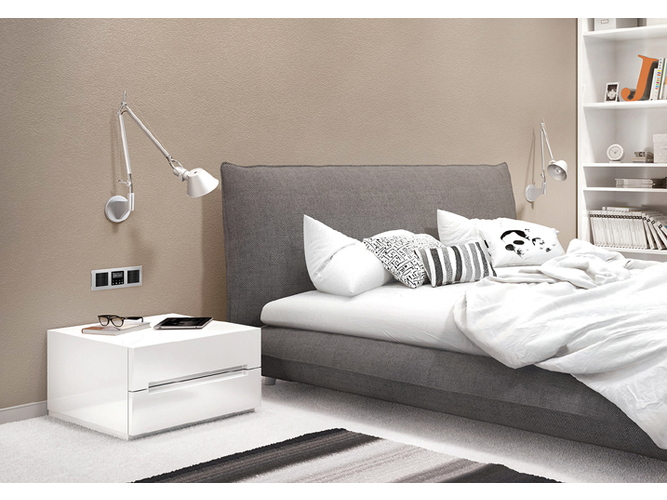 Pure elegance makes a clear statement. 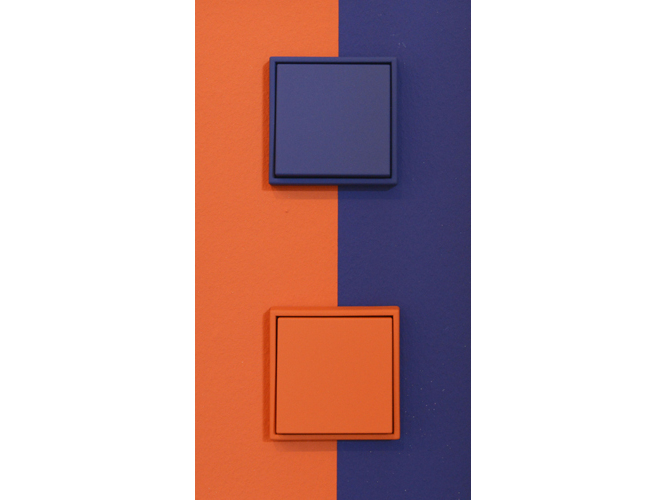 Dark matt-painted aluminium gives the straight lines of this classic switch its intense charisma. 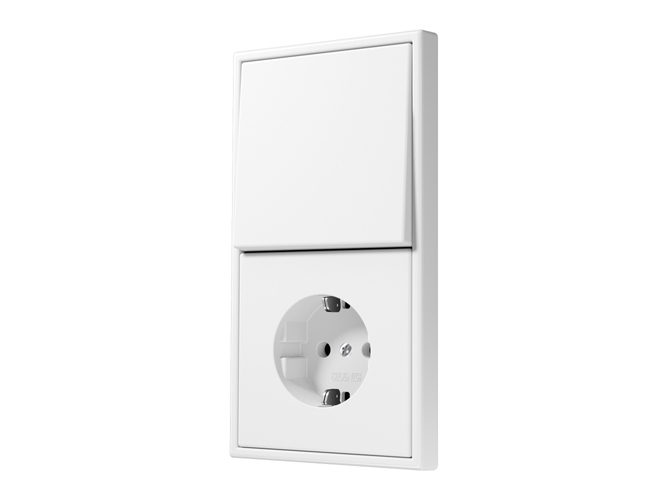 This enables the LS 990 in dark to make a special appearance in modern electrical installations. 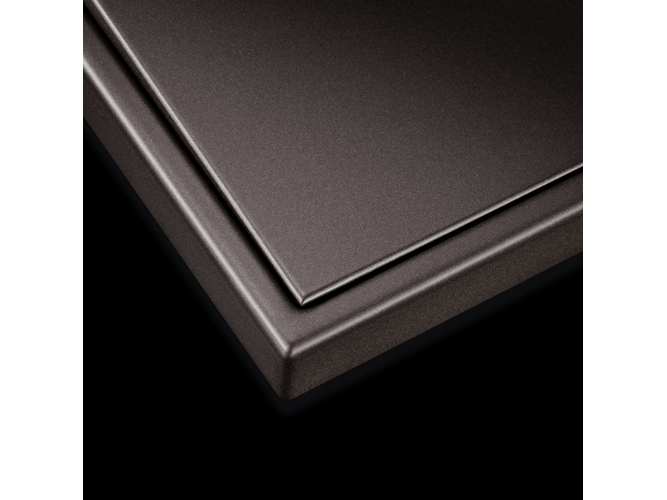 The interplay between dark colour, clear form and high-class material makes aluminium dark stand out. 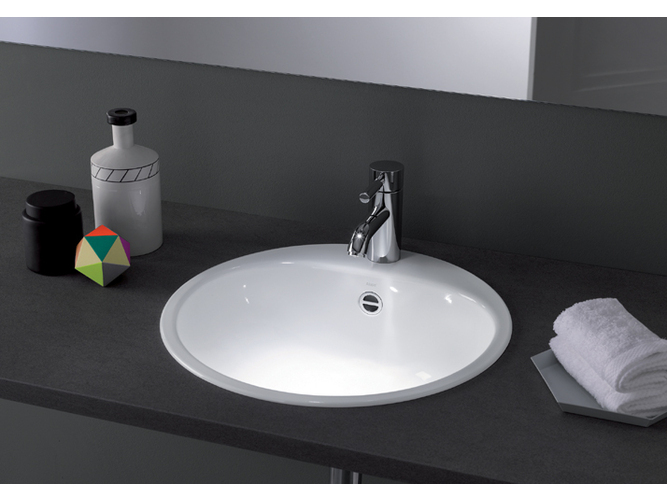 While it harmonises with dark shades, it creates elegant contrasts in combination with light colours. Of course, as with all the variations in the LS range, the dark versions can also be stylishly combined with frames and covers from other colour and material versions. 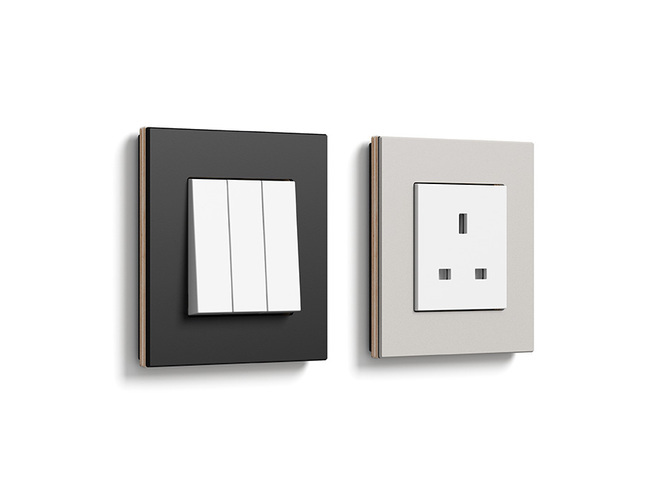 All the technical demands of modern electrical installation can be elegantly implemented this way. 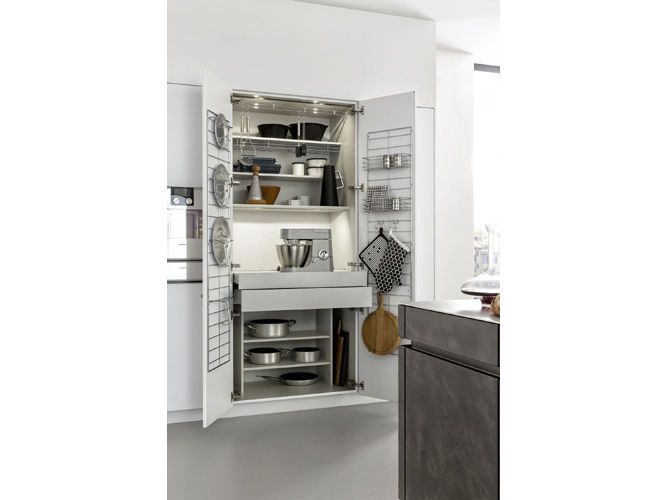 A wide variety of controls combine design, convenience and safety here. The international jury of the German Design Council allocated the Iconic Awards 2015, the international competition for architects, designers, construction and industry. 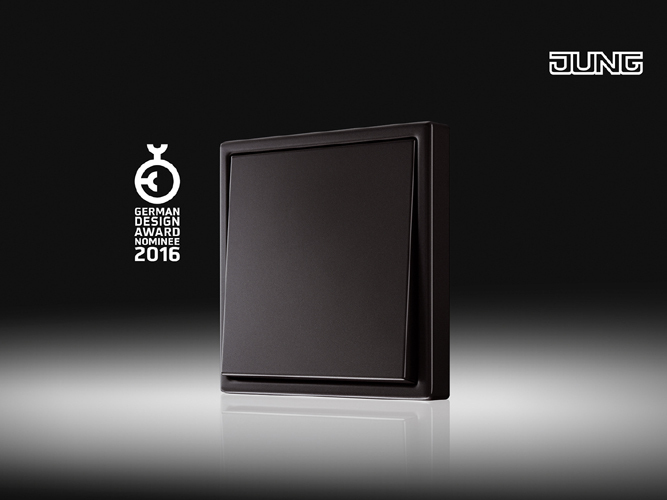 In the category "Product" the JUNG classic switch LS 990 in Dark was awarded with of "Best of Best". As the first international architecture and design competition the Iconic Awards honoring the "icons of our time" and are the first neutral international competition, taking into account the disciplines in their interplay. 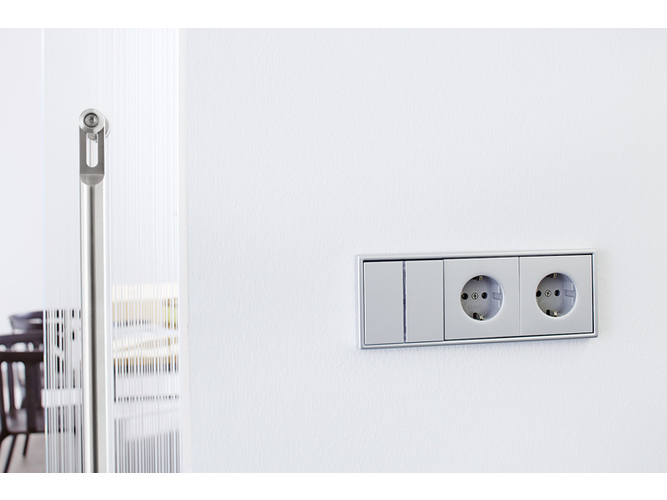 Thanks to its high quality and clear shape, the LS 990 switch range has already proved its worth for more than 40 years. 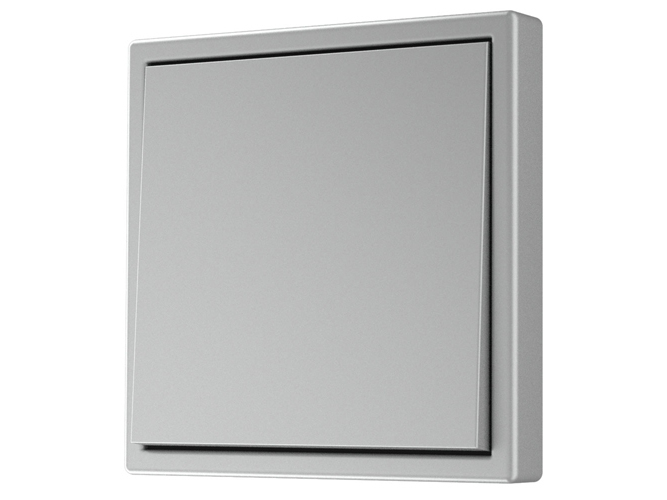 The classic form of this switch with its narrow frame fits harmoniously into any surroundings. 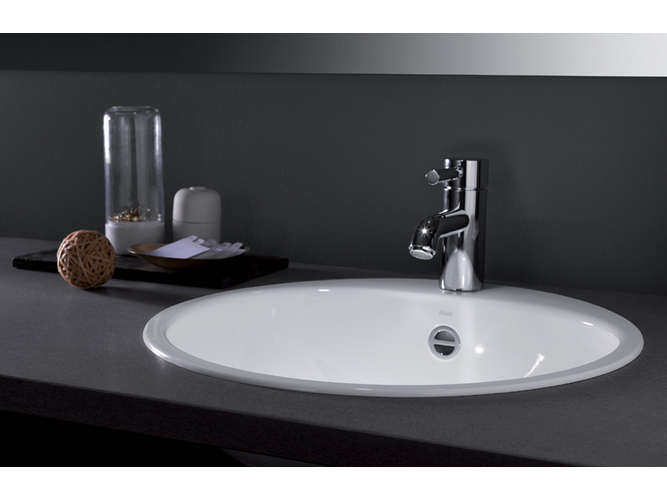 Purist elegance in thermosetting plastic or genuine metal lend this series a touch of class. 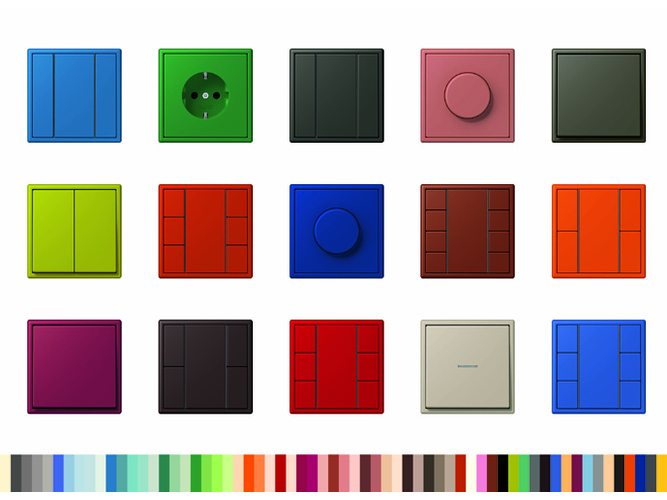 A wide variety of applications are possible thanks to the wide functional spectrum. Thus, architecturally demanding visions can be consistently put into practice. 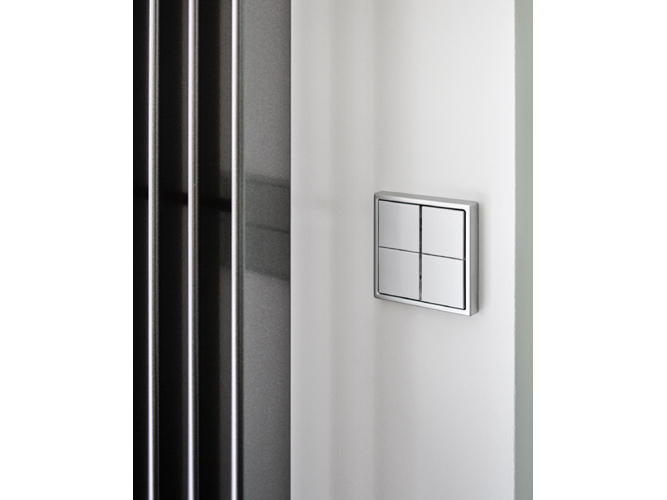 The single to fivefold frames can be fitted horizontally or vertically. Canadian political and cultural philosopher Mark Kingwell reminisces about a national extravaganza that he never got to visit and in retrospect finds it to have been a chimera of cheerful optimism. Here is my key memory of the 1967 Montreal World’s Fair: while my parents planned a visit to this global spectacle of an event commemorating Canada’s centenary, a watershed moment when my chronically insecure country was without doubt the coolest place on Earth, I was parked at my grandmother’s bungalow in the dull eastern reaches of suburban Toronto. It’s true I was only four years old, and thus likely incapable of appreciating the wonders erected on the island city in the Saint Lawrence River; nevertheless, I still resent a little bit that my parents went to Expo and all I got was a lousy key chain. I kept the key chain for years, however, and grew progressively more fascinated with the signature forms of that Fair, to me as instantly signifying as the Trylon and Perisphere of the 1939 New York World's Fair, that celebration of “the world of tomorrow”. In Montreal, Moshe Safdie’s beautifully modular Habitat housing scheme, the glass inverted-pyramid Katimavik building, and Buckminster Fuller’s signature geodesic-dome pavilion for the United States all realised, via architectural imagination, the space-era togetherness of the New Age. The vision was straight out of the toy box of urban construction sets like Super City, the sort of toy I would myself enjoy in a few years, with their future-is-now geometric silhouettes and clean, soaring curtain-wall towers. Expo ’67 was the shiny side of the coin for that troubled decade, a vision of city harmony and smooth technological progress that ventured to cash in the “democracity” promissory notes of 1939. The 1967 fair’s official theme, “Man and His World”, was taken from a text by Antoine de Saint-Exupéry, the visionary aviator, children’s literature author, and closet fascist, but it smacked likewise of Marshall McLuhan – by way, somehow, of Teilhard de Chardin. The universal brotherhood of mediated, techno-happy existence! Canada, and the Future, had never been so awesome: die Stadt von Morgen, but here today. Never mind, then, that many American cities were suffering waves of white flight, eviscerating the downtowns of Detroit, Philadelphia, Buffalo, Cleveland, and a host of lesser cities. Two years later a human being would walk on the moon, but the very next year would witness the assassinations of Martin Luther King, Jr. and Robert Kennedy. Closer to home, even as the bright strains of Bobby Gimby’s hit song “Ca-na-da” sprang from transistor radios across the nation the Front de libération du Québec threatened to disrupt the fair. Over the next three years, spurred in part by French President Charles de Gaulle’s notorious shout from the balcony of the Old City Hall in July of 1967, “Vive le Québec libre”, the FLQ would bomb, kidnap and kill in the name of Québec separatism. By the time Prime Minister Pierre Trudeau invoked the draconian War Measures Act in October 1970, and tanks rolled onto the streets of Montreal, the cheerful optimism of the Expo summer had evaporated entirely. The site of the fair, meanwhile, has suffered the usual depredations of time and civic neglect. Even though Expo ’67 managed to avoid the typical cost overruns and corruption-drive Montreal boondoggles that cripple municipal projects in Canada’s showcase city (the 1976 Olympics are a case in point, with stadium debts still on the books decades later), the modest financial success of the Fair did not translate into lasting cityscape. In part this failure is rooted in the original Ile Notre Dame location, which is neither easily accessible nor part of the city’s core urban fabric. Safdie’s Habitat development was sold to private investors and made into a fashionable, if remote, condominium community in 1985. Fuller’s dome was partially destroyed by fire in 1976, and began to resemble a dystopian science-fiction film set and so prompted, as is so often is the case with the forward-looking design, a feeling of inverted nostalgia, the future in ruins. Mark Kingwell is a Professor of Philosophy at the University of Toronto and a contributing editor of Harper’s Magazine in New York. He is the author or co-author of seventeen books of political, cultural and aesthetic theory, including the bestsellers Better Living (1998), The World We Want (2000), Concrete Reveries (2008), and Glenn Gould (2009). In addition to many scholarly articles, his writing has appeared in more than 40 mainstream publications, including Harper’s, the New York Times, the New York Post, the Wall Street Journal, the Guardian, Utne Reader, BookForum, the Toronto Star and Queen’s Quarterly; he is also a former columnist for Adbusters, the National Post, and the Globe and Mail. Professor Kingwell's most recent book is a collection of essays on politics, Unruly Voices (2012); a new collection of his essays, Measure Yourself Against the Earth, will appear in September 2015. Lillian Seymour is the assumed author of the photographs that appear alongside Mark Kingwell’s essay. The images were discovered within a scrapbook lying in the street in Cambridge, Massachusetts in 2006. 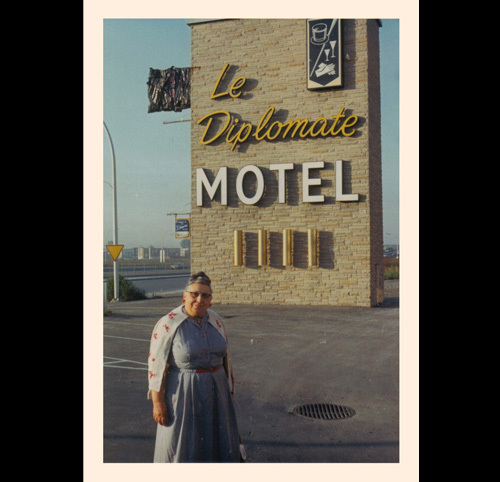 As well as a trip to the Montreal Expo in 1967, the album reveals that Lillian had also visited New York’s 1964 Expo. They were scanned and uploaded to Flickr under a Creative Commons license by Austin Hall. “Our culture, our knowledge and our lifestyle encapsulated.” That was the formidable task assigned to two cauldron-like vessels in 1968 during the first meeting of the Expo ’70 Time Capsule Committee sponsored by Panasonic Corporation and Mainichi Newspapers. Two sets of 2,098 items were selected for burial, including various samples of synthetic materials, foodstuffs and toys, documentation of the atomic bomb, Japanese coins and flag, the contents of a ladies’ handbag and a pair of slippers. The entire collection was then sterilised using ethylene oxide gas, or in some cases, such as that of the katsuobushi (dried, fermented tuna), via exposure to cobalt-60 radiation, before being buried in the two spherical, stainless-steel containers at the Osaka Castle Park site. A Tutankhamun’s tomb of the twentieth century (without the body obviously), one of the capsules is to remain buried for 5,000 years for posterity and the benefit of our descendants. The other, containing its matching set of contents, was re-opened for the first time in 2000 and will be opened again every 100 years hence – because five millennia are an awfully long time to wait for seventies fashions to come round again. Photo courtesy The Mainichi Newspapers Co‚ Ltd. / Panasonic Corporation. Flying in on the fanciful coat tails of space age optimism and 1960s socially-minded utopianism, the Osaka Expo 70 can be considered the last of the great, experimental expositions before finite resources and techno-progressive pragmatism began to dominate the agenda. Crystal Bennes investigates an Expo future vision that revolved around Buckminster Fuller spheres and Metabolist cells. Defined by a pervasive sense of architectural risk-taking and experimentation, both in its ideology and design, it’s hardly surprising that, forty-five years on, images of the 1970 World’s Fair in Osaka look as fresh, even futuristic, as ever. The first Expo to be hosted by an Asian nation, the theme of Osaka 70 was “Progress and Harmony for Mankind”. Leading a team of 11, including fellow Metabolists, Kikutake Kiyonori and Kurokawa Kisho, as well as artist Taro Okamoto, a key figure of the Japanese avant-garde, Kenzo Tange was the man responsible for the suitably progressive masterplan. Tange rose to prominence in Japan with his design for the 1955 Hiroshima Peace Memorial Museum, as well as stadiums for the 1964 Tokyo Olympics often described as some of the most beautiful structures built in the twentieth century. By 1960, he had begun to shift focus from individual buildings to urban development, designing ambitious plans to redevelop Tokyo’s infrastructure and housing on a grand scale. If post war Japan offered few opportunities for Tange to realise such plans in reality, the 1970 Expo presented at least an opportunity to test some ideas on a larger platform. Inspired by the vaulting, unifying roof of Joseph Paxton′s 1851 Crystal Palace and propelled by Buckminster Fuller’s developments of Alexander Graham Bell’s space frame, Tange’s most visible Expo contribution was a giant roof for the Festival Plaza – at the time, the largest space frame structure ever constructed. For Tange, the vast frame was a symbolic link between the Festival Plaza and the other structures, unifying this spatially, while allowing pavilions their own visual identities outside the frame. Conceiving of the Expo as a festival “where human beings can meet, shake hands and accord minds”, he saw the plaza as an important central site for such activity, “contributing to the development of this festival of human harmony”. One of the most visible architectural influences across Expo 70 was that of Metabolism, which was formulated a decade earlier by a group of architects including Tange, Kikutake and Kurokawa. Rejecting the fixed proscriptions of form-follows-function modernism, the Metabolists, inspired partly by biological concepts, sought to respond to ever-changing urban environments with systems of interchangeable components. Kurokawa’s contribution to the Expo was textbook Metabolism. His tree-like Takara Beautilion was a steel-framed structure with the “potential to extend, or replicate horizontally and vertically depending on necessity”. Elsewhere, architectural and structural experimentation seemed to encapsulate the spirit of the early, post-space-age period. The US effort, with its exhibition of Moon rock from the Apollo mission, is one obvious expression. Based on Frei Otto’s experiments with pneumatic structures, architects Davis, Brody, Chermayeff, Geismar, de Harak Associates covered an 80 x 142 metre super-elliptical structure with a translucent fiberglass fabric – held up by nothing more than its own internal air pressure. Yutaka Murato and engineer Kawaguchi also experimented with pneumatics to striking effect. Their enormous Fuji pavilion, comprised of 16 arches of inflated plastic tubes, was the largest air-inflated structure in the world at the time. Buckminster Fuller’s Octet Truss system inspired more than just Tange’s space frame, and many pavilions took the form of a geodesic dome – notably Fritz Bornemann’s spherical concert hall for the West German pavilion and the nine half-domes of Sachio Otani’s Sumitomo Fairy Tale pavilion. In other cases, innovation emerged for unusual reasons, such as E.A.T.’s project by physicist Thomas Lee and artist Fujiko Nakaya to cloak Tadashi Doi’s faceted Pepsi pavilion dome – which they loathed – in artificial clouds. 2. View towards the site’s amusement zone: “Expoland”. 4. USSR Pavilion, designed by Mikhail V. Posokhin. 6. Netherlands Pavilion by Jaap Bakema and Carel Weeber. Crystal Bennes is a writer, curator and artist based in Finland and a contributing editor to uncube. Along with Cecilia Lindgren, she is co-editor of independent culture and urbanism magazine, Pages Of, and contributing editor of Icon magazine. She runs the blog Development Aesthetics and is one third of the London Research Kitchen. The Osaka Expo is often considered the last of the great, experimental expositions. If there’s truth in such claims, it’s interesting to consider the reasons why. Many architectural historians view the 1960s as a golden age of socially-minded architecture, a time when architects were thinking how people could live better lives and how architecture could involve itself in the realisation of such activity. And yet, if the 1960s were a golden age – and Osaka its apex – such goldenness was only possible due to a certain degree of ignorance. The period immediately following the Expo saw the 1972 publication of The Limits to Growth, an influential report simulating exponential economic and population growth in a world of finite resources, and then came the 1973 oil crisis. In this new era, informed by scarcity and increasing recognition of the impossibility of infinite growth, focus shifted away from experimental, futuristic social utopias towards networked, techno-progressive pragmatism. What makes a successful Expo? Financially and in terms of visitor numbers, Expo 2000 was a flop but it scored when it came to recycling after the event. Rob Wilson looks beyond the bling towards cultural values, infrastructural advantages and small footprints. Just as abandoned fairgrounds often serve well as creepy settings for horror films, the derelict bones of old expos look particularly macabre: decayed carcasses of once spectacular structures built to fizz with positivity and ideas for the future. One example of this is the MVRDV-designed Dutch Pavilion from Expo 2000 in Hanover, Germany, once star of the show, now a forlorn, rotting shell. With its theme of “Holland Creates Space”, responding to the Expo’s one of “Humankind, Nature, Technology”, the Dutch pavilion was a 36-metre-high tower of six stacked landscapes symbolising and demonstrating how to maximise the use of limited space. Visitors moved up through its tulip fields to a small lake at the top, where windmills ran turbines powering the structure. Originally the plan post-Expo had been to dismantle and re-erect the building in the Netherlands, but this was deemed too costly. With even demolition proving expensive, the pavilion was apparently given away with a cash dowry to a man who promised to give it a second lease of life. Later this recipient tried unsuccessfully to sell the pavilion on eBay, and now it is owned by his son, seemingly too cash-strapped to either renovate or demolish it. With a touch of schadenfreude, the pavilion’s remains might seem a fitting monument to misplaced millennial optimism and the symbolic legacy of Expo 2000, widely seen as a relative failure at the time: only 18 million tickets were sold against a projected 40 million (compared to the 64 million in Osaka in 1970 or Shanghai Expo 2010’s 73 million) and it ended with a financial deficit of some 3,900 million deutschmarks. But the story of ambitious legacy intentions before the event, later overtaken by any ad hoc needs-must solutions going, is a familiar one post-Expo. Indeed Expo 2000 was actually one of the more successful iterations when it came to recycling its old pavilions. Whilst most were demolished, the Belgian Pavilion for instance is now known as the Peppermint Pavilion, housing an event space, recording studio and record company. Meanwhile the Mexican Pavilion popped up in Braunschweig, as the library for the University of the Arts there, while the Nepalese Pavilion was resurrected at the centre of a botanical garden in Bavaria. – be it a cool-contemporary national image for the Weimar Republic, offered by Mies van der Rohe’s German Pavilion in Barcelona in 1929, or the turn on, tune in, drop out, and er, drink Pepsi message of the Pepsi Pavilion designed by E.A.T. for the Osaka Expo in 1970. Secondly, beyond the spin, Expos have often initiated or promoted actual technical and cultural shifts, either by allowing the space or license to attempt some daring new engineering feat – the moving walkways at the 1900 Paris World Fair, the unprecedented iron girder structure of the Eiffel Tower in 1889 – or by providing a forum where a new visual trend or style can coalesce. The so-called “White City” of Chicago’s 1893 Columbian Exposition set off a global neo-classical revival, while the 1925 Exposition Internationale des Arts Décoratifs et Industriels Modernes in Paris lent its name to the Art Deco movement. The third type of legacy is the actual, physical, urban knock-on effect for a host city; the seeding of urban expansion or new neighbourhoods through improved infrastructure or through showcasing new models for living: as at the Montreal Expo ’67, with its new Concorde Bridge, monorail and Habitat housing complex, or the laying out of the new EUR district for the (cancelled) 1942 Esposizione Universale in Rome. Those individual buildings or structures that transcend their Expo genesis and make it to a useful afterlife are usually ones that successfully combine aspects of all these types of legacy, acting as memorable icons, representing technical advances or providing practical future facilities. Paralleling Robert Venturi and Denise Scott Brown’s observations in Learning from Las Vegas, on that more permanent urban encampment of signs and showstopper attractions, these generally fall into two types: ducks or decorated sheds – structures that symbolically carry a message or embody a brand, easily transferable from Expo to city (usually tall and distinctively profiled e.g. the Atomium in Brussels) or buildings that offer ultra-flexible re-use (usually vast and shed-like e.g. the Grand Palais in Paris). The 1851 Great Exhibition, the first Expo, still remains the model to beat in terms of delivering on all legacy fronts. It acted as a condenser for Britain’s image as the workshop of the world and transmitted powerful British Empire PR, not only to its six million visitors but also as a worldwide news event: witness all the other countries that jumped to emulate it. It also turned in a healthy profit, which was ploughed back into a new museums’ quarter in Kensington. The innovative cast iron and plate glass structure of the Crystal Palace, designed by Joseph Paxton, both distinctive symbolic duck as well as enormous decorated shed, was rebuilt in extended form in South London, providing a capacious flexible venue for over 80 years until it burned down in 1936, and simultaneously becoming the generator for a whole new London suburb around it. 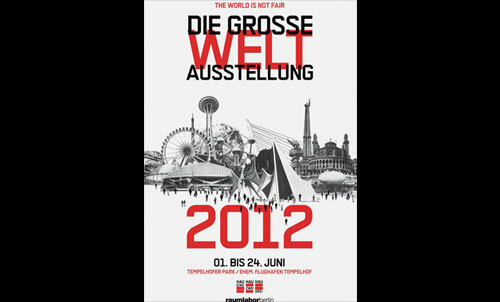 Organised by the architects raumlaborberlin and the Hebbel am Ufer theatre, “The World is Not Fair – The Great World's Fair 2012” was probably the first DIY Expo ever. Fifteen artist groups – mostly from Berlin – build fifteen strange structures spread generously over the vast, flat emptiness of the former Tempelhof airfield in Berlin, throughout the month of June 2012. Some participants used existing structures on the site: a bunker was turned into a cinema, for example, and a former kennel for security dogs became a small performance theatre. Others were built new, from scratch, using low-cost and recycled materials. The “pavilion” pictured here and titled 52.4697°N 13.396°E, was made by artists Branca Prlić and Tamer Yiğit and intended to act as an “assembly point for people without permanent residence”. Conceptual masterplan for the Expo 2015 by Stefano Boeri, Herzog & de Meuron, William McDonough and Ricky Burdett. Stefano Boeri, Herzog & De Meuron, William McDonough and Ricky Burdett were invited to design the masterplan for the Expo 2015 in Milan. By 2011 they had all left the project. In an exclusive interview with uncube, Jacques Herzog explains why. How did you get involved in designing the masterplan for the Expo 2015 in Milano? We were invited by Stefano Boeri, who is based in Milan and was commissioned to develop the masterplan. His ambitions were to fundamentally rethink the entire Expo format. The concept of a “World’s Fair” appears to be very outdated. It is a model from the last century, and Stefano really wanted to turn it into an exhibition for the 21st century. So he invited us to work together with William McDonough and Ricky Burdett on this masterplan, because he knew we would share his ambition to radically reinvent the idea of a World’s Fair. He also knew he would need a strong team in order to turn this revolutionary ambition into reality. What made you think the Expo in Milan would be interested in such a radical and critical approach? I have seen a few World’s Fairs. Particularly the last one in Shanghai in 2010 made it clear to me that these Expos have become huge shows designed merely to attract millions of tourists. A giant area filled with enormous pavilions, one always more spectacular than the other, and these unbelievable vast halls for gastronomy, shops and pissoirs. What a bore and a waste of money and resources! We decided only to accept the invitation to design the Milan masterplan if our client would accept a radically new vision for a world exhibition; abandoning these monuments of individual national pride that have turned all Expos since the mid-nineteenth century into obsolete vanity fairs. Instead we wanted to oblige every participant to channel all their pride into their contribution to the Expo’s theme of “Feeding the Planet”: addressing the important topics of food production, agriculture, water, ecology etc. The content of the exhibitions should make the countries look different, not the size of their pavilions. Also we felt that this expo would be exactly the right place to start focusing on content, because it simply seems embarrassing to address this very important topic and at the same time built enormous, dramatically curved pavilions with facades in wavy plastic or with spectacular waterfalls or whatever. We would much rather know how countries like Kenya, Mexico, China, Laos or Germany are dealing with the question of how to feed their people. How did your masterplan try to disrupt the dominance of the national pavilion architecture? We suggested a strong basic and generic pattern with two big main axes based on the cardo/decumanus orthogonal grid of the antique Roman city. This would create a grid of extremely long and rather thin plots, with every country having a plot of the same size. We proposed encouraging all participants to present their exhibitions as agricultural gardens with only very simple, basic shacks forming sheltered spaces for their exhibitions. All of this would have been covered by a structure of tent roofs stretching over the entire site, provided by the organisers. This would have resulted in all participants having plots of equal size under the same light roof structure, with no big individual pavilions. This would indeed have turned the Expo as we know it upside down. Did you really think you could get away with these radical ideas? Our intentions were clear from the very beginning and the organisers understood and supported us. However they were not powerful or courageous enough to convince their own organisation and the responsible politicians to support them. As a consequence they were reluctant to convey that fundamental message to the participating countries to forgo their individual designs and break with the Expo traditions they have all been following for so long now. It was clear to many people that the themes of this Expo deserved to be treated differently, but they were not prepared to follow our guidelines. So what happened to your masterplan? It became the official basis for the Expo in Milan - yet only as an urbanistic and formal pattern, not as an intellectual concept. The tent roofs we proposed are now covering the main boulevard in front of the national pavilions, which seems an absurd reversing of our ideas. As I said, we are not involved in the realisation of the Expo anymore. From what I have heard about the coming pavilions and concepts, it seems that this Expo will be the same kind of vanity fair that we’ve seen in the past. What was lacking to have made your concept reality? I cannot put the blame on anyone or anything in particular. All the people we discussed our concept with were quite intelligent and understanding - but bound to their employers and/or voters. I still think that everyone involved at Expo agrees with our critical vision of what a World’s Fair should be and that the basic idea behind it should be kept for the next possible occasion. But when if not there, in Milan, with people like Stefano Boeri and Ricky Burdett on our side, could we convince an Expo client to take that risk? An event this big (and expensive) has many forces acting upon it and I am not even sure if there ever was a conscious decision against our concept. Maybe it is rather like a swarm of fish swimming in one direction; we tried to navigate it in the other, but somehow they kept swimming. Maybe we should have initiated a diplomatic mission, sending the very talented “diplomat” Ricky Burdett to every single participant, explaining our concept, and to win them over. But this was impossible, and we then realised that the organisers would not – or could not – undertake the necessary steps to make these ideas happen. Since 2011 none of the offices are involved anymore – Boeri, McDonough and Burdett got out, and we decided to end our collaboration with the Expo team that was an almost daily exchange until that moment. The Expo team has dealt with the realisation themselves since then. Yet the structure will still be based on your ideas. At least that’s what the Expo office tells us. Do you believe that this Expo will be different from the others, even just a little bit? I believe that some countries understood our concept and therefore will put more weight on content than on form. Also, as far as I know there will be 13 NGOs like Oxfam and WWF adding some important topics. But they will have small, modest venues compared to the big global companies like Monsanto, Syngenta, New Holland or Agriculture, which will be present with huge shows – and we can expect similar marketing shows from many of the participating countries. So I am afraid that the visitors will again be blinded and distracted rather than informed and made aware of chances and risks, of opportunities and difficulties, of politics and business, etc. There is an amazing variety of global themes that should be tackled and brought to the fore – the conventional format with national pavillons competing for design awards cannot deliver that! Much to your own surprise, you became involved with the Expo once again in 2014 when Carlo Petrini asked you to design the pavilion for the International Slow Food Movement. Why did you decide to work again within the framework of your own failed masterplan? That was only because of Carlo, who had been working with us on our ideas for the Expo from the very beginning. He was reluctant himself about joining a big show event like this, but had finally agreed to present Slow Food on a very prominent location within our grid: a triangular plot at the eastern end of the central boulevard, which we always imagined to become one of the main public forums. We felt that it would be great to have Carlo and his ideas and convictions being represented, so we couldn’t resist. Jacques Herzog was born in Basel in 1950. He studied architecture at the Swiss Federal Institute of Technology Zurich (ETH) from 1970 to 1975 with Aldo Rossi and Dolf Schnebli. He has been a Visiting Professor at the Harvard Graduate School of Design since 1994 and a Professor at the ETH Zurich since 1999. Herzog established the architecture practice Herzog & de Meuron with Pierre de Meuron in 1978 in Basel. Today the company is run by five senior partners: the two founding members along with Christine Binswanger, Ascan Mergenthaler and Stefan Marbach. An international team of 41 Associates and about 420 collaborators is working on projects across Europe, the Americas and Asia. The firm’s main office is in Basel with additional offices in Hamburg, London, Madrid, New York City and Hong Kong. Herzog & de Meuron have designed a wide range of projects from the small scale of a private home to the large scale of urban design. While many of their projects are highly recognised public facilities, such as their stadiums and museums, they have also completed several distinguished private projects including apartment buildings, offices, and factories. The practice has been awarded numerous prizes including The Pritzker Architecture Prize (USA) in 2001, the RIBA Royal Gold Medal (UK) and the Praemium Imperiale (Japan), both in 2007. I believe that our Slow Food Pavilion will demonstrate how we had imagined all the pavilions of this Expo to be. It is composed of three very simple shacks made of almost archaic wooden structures, like market stalls, which define a triangular courtyard, an open and communal space. After the Expo they will be easily dismantled and reassembled as garden sheds in school gardens around Italy, to be used by Carlo’s Slow Food Movement for their ongoing educative school programme. Do you think that the upcoming Expo editions in Antalya, Astana and Dubai will pick up on the principles of your collective masterplan? I still believe that most of all we have to overcome this ridiculous system of national pride represented by individual pavilion design. Difference should be real, i.e. based on content, not on architectural design – basta! A World’s Fair must expose common topics and problems, presenting different ways of dealing with these problems in different regions of our world. That would be an amazing and exciting exhibition that I would be eager to visit on the very first day it opens. Yet of course this is much more difficult than to simply stick to the existing model, and that’s why unfortunately it is very unlikely that it’s going to happen anytime soon. I would rather expect the upcoming Expos to be more like the one in Shanghai again, trying to attract an ever-larger crowd of visitors. If you say that so many people were convinced by the ideas inherent in your masterplan, what would it take to make things change in the future? Richard Van der Laken, co-founder and General and Creative Director of the annual Amsterdam design conference “What Design Can Do” (WDCD) dropped round for a visit at the uncube office whilst he was in Berlin collecting supporters and speakers for the next edition of his design conference which takes place in May this year. The WDCD conference aims to explore what it says on the tin, seeking to be a call to action platform for designers. Sophie Lovell talked to Van der Laken about turning words into deeds. Over the past few years, attention within the disciplines of design has shifted away from “product” towards thinking, strategies and how design relates to people. What has prompted this shift in your view? The crisis of 2008 made everybody think. Whether you were a salesman, butcher, banker or designer, everybody suddenly saw that this system, this society we are living in, could go down. I think that many people then began to ask themselves: “What can I do to make this world we live in more liveable, fair and clean?” When you ask yourself this question as a designer, you immediately have to step out of your comfort zone, and many designers now look further than their own discipline. 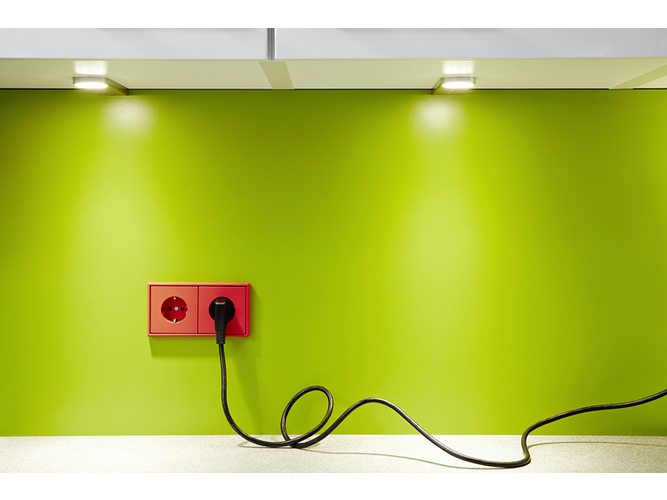 What led you, as a graphic designer, to co-initiate the WDCD conference five years ago? The name of the event says it all. We wanted to share our vision that design can make a difference in society and show that it is not just about aesthetics. A lot of people outside the design world still believe that design is there just to make things prettier. Do you think that view is changing? Seriously, can designers really make a difference? Are they not too much under the thumb of industry and marketing mechanisms? Look at the Dutch designer Daan Roosegaarde, with his Smart Highway project, or innovator Bas van Abel who created a clean and fair cellphone called the Fairphone. They are good examples of how designers can act as initators. That is a big new role for designers: not waiting for an enlightened client to turn up, but doing it themselves. How much of this kind of conference is about designers just presenting their ideas to other designers – preaching to the converted – and how much about actual implementation of those ideas? Do you not need to be reaching out more to people in industry, business, banking, government and administration – challenging how they think? It is something we’re always struggling with. As a designer you should be able to answer the question: “What can design do?” (Although many designers still don’t know...) For us it is important to be a platform for that call to action for designers, saying: You have certain skills, please use them in the right way. On the other hand we need industry and governmental organisations too. As a designer you are part of a big chain. 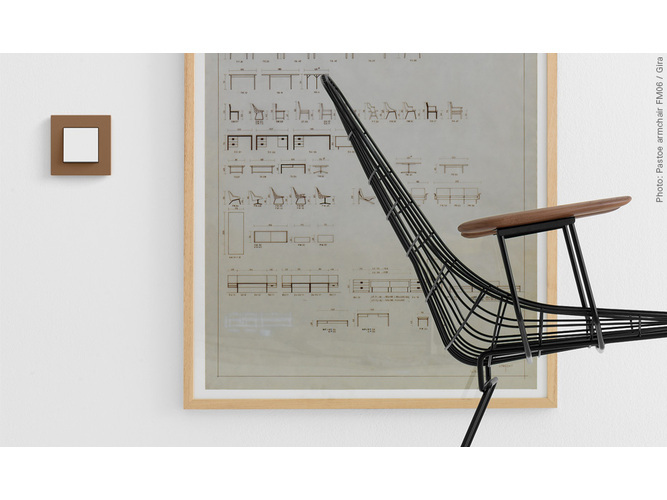 The Dutch designer Richard van der Laken co-founded De Designpolitie with Pepijn Zurburg in 1995. 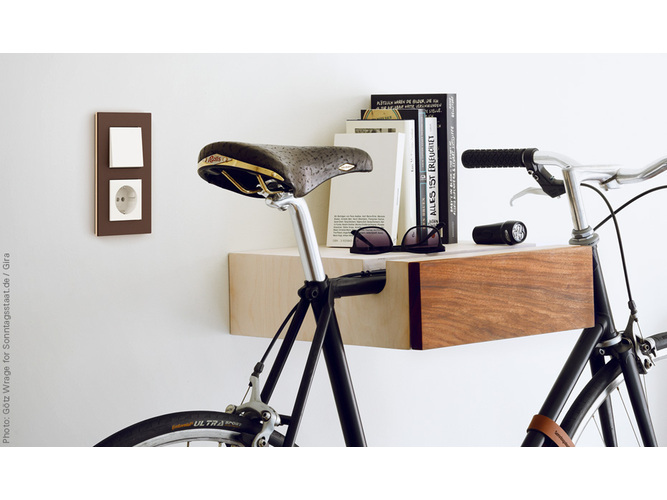 The design practice consists today of a small international team of talented and ambitious designers and producers. They produce communication and identity design for clients in the non-profit and commercial sectors with an emphasis on cultural and social organisations. They are also are the initiators, curators and organisers of What Design Can Do, an international event and movement about the impact of design on society. The next What Design Can Do conference is in Amsterdam on the 21 and 22 May 2015. uncube are media partners of the event. Getting those parties inside and engaged is a difficult task. To stimulate this, we want to redeem the promise of WDCD by starting the What Design Can Do Challenge. It will include a call for proposals on the very pressing issue of refugees. Or to give it a slogan: What Design Can Do For The Refugee. We want international design teams to work on solutions – and make a difference. One of the 2015 conference themes is politics. Where would you like to take WDCD in the future? What would you like to see it achieve beyond talking – or is talking enough? A model for the structure of the West German Pavilion designed for Montreal Expo 67 by Frei Otto.